firstly the stallion Vonolel foaled in the Nejd in 1875 , purchased in Bombay as a Charger for field marshal Earl Roberts. I just want to add that as I took these pictures from my books they are already in the public domain and I dont believe copyright will be an issue in this case. Moving it to the Living Library forum. It certainly would be complex and I am no copyright expert, but we'd need to see what kind of use we can make of them. After all we won't be showing the painting as such, just a small picture of them, which we could even think as being advertising them. I am just saying that it is one the the things that needs to be considered, especially as we would be making it sort of a persisting "thing", contrary to a thread that kind of dies a few days after no replies are added to it. I think we can skip the copyright issue for now, and consider the other issues. Meanwhile, we'll try to find out where we are in the copyright issues. I think we'll have a gallery. The LL can be an option, but we'll be addressing many changes on the site soon, too, so we'll just need to consider what we want of it and what is the best way to achieve it. There are many questions that can be raised about the gallery: should we keep one or several? who gets to decide what goes into the gallery? What will the requirements be for that? How is copyright to be considered when keeping such a gallery? Please don't think these are excuses not to have one, because they aren't, but they definitely need to be considered, as they will certainly show up as soon as we get going, so we better be prepared to handle them. Maybe it's better to start a topic on the gallery where this can be addressed. What do you think? Well Art is one of my passions and my house is full of paintings all originals . I thoroughly enjoyed looking at this thread and it made a refreshing and enjoyable change . I would say to the critic why do you think the the Arabian type was replaced by some of the heavy chargers . Simple the Arabian was and still considered the most beautiful of horses , a real gem that everyone in power or high stance wanted . 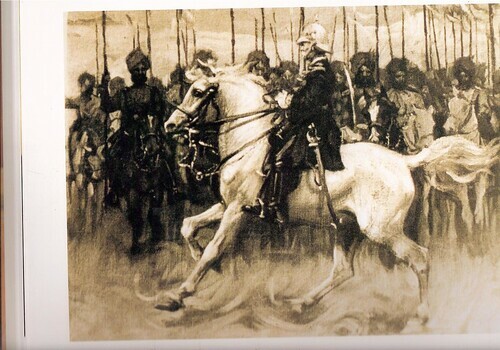 Quite often the sitter would ask to be placed mounted on an Arabian . This is a beautiful and very interesting thread. What about making the gallery a section in the Living Library? I haven't had time to put any up yet but I think that this is a great thread... please Admin , could the pictures be collected into a permanent A/L gallery that people can add to over time , preferably with a bit of info about each?? I think that is definitely something that we can do, just would need to consider how we can do it. Probably keep them safe for now, on a sticky thread or something and consider this for the upcoming new AL web site. Such beautiful works of art of an even more beautiful subject , fantastic thread Lynda . Gorgeous, they're definitely not of 'cob' origin are they ! This is a lovely thread. This may be the last I can post for this month as I am almost at my limit for flikr, painted 1838 is all I can tell you about this one. Nice thread. , I will try to add some tonight. 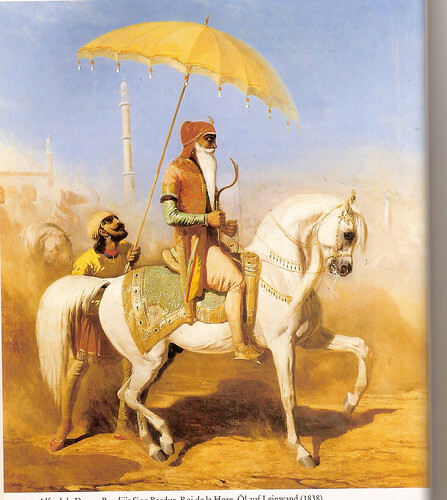 Did you see on page 18 of the latest a photo that is the spit of The Arab Tent painting? It is of Karmaa and her filly foal Karmia. Actually it's not exactly the same as the mare is standing up but the sentiment is the same and you can see where Landseer took his inspiration from. 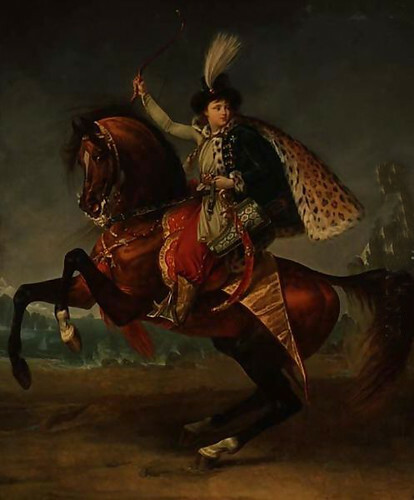 canvas painting from about 1762 by British artist George Stubbs showing the Marquess of Rockingham's racehorse, rearing up against a blank background. The huge canvas, lack of other features, and Stubbs' attention to the minute details of the horse's appearance give the portrait a powerful physical presence. It has been described in The Independent as "a paradigm of the flawless beauty of an Arabian thoroughbred". Stubbs' knowledge of equine physiology was unsurpassed by any painter; he had studied anatomy at York and, from 1756, he spent 18 months in Lincolnshire where he carried out dissections and experiments on dead horses to better understand the animal's physiology, suspending the cadavers with block and tackle to sketch them in different positions. The careful notes and drawings he made during his studies were published in 1766 as The Anatomy of the Horse. Even before the publication of his book, Stubbs' dedication to his subject reaped him rewards: his drawings were recognized as more accurate than the work of other equine artists and commissions from aristocratic patrons quickly followed. Charles Watson-Wentworth, 2nd Marquess of Rockingham, a Whig politician who would later serve two terms as British Prime Minister, commissioned Stubbs to produce a series of portraits of his horses, one of which was Whistlejacket. A chestnut (or sorrel) stallion, with lighter mane and tail, Whistlejacket was foaled in 1749 at the stud of Sir William Middleton, 3rd Baronet at Belsay Castle in Northumberland, and named after a contemporary cold remedy containing gin and treacle. His sire was Mogul and grandsire was the Godolphin Arabian; through his dam, he was also descended from the Byerly Turk, and various other Arabians and Turks. He raced from 1752, winning many races in the North. He lost to Jason in the King's Plate at Newmarket in 1755, but won the following year, and was also narrowly beaten by Spectator for the Jockey Club Plate at Newmarket in 1756, and was sold soon after to the Marquess of Rockingham. He famously won a four-mile race at York in August 1759 against a strong field, beating Brutus by a length, and then retired to stud. He was beaten only four times in his racing career, but was notoriously temperamental and difficult to manage. Stubbs depicts him rising to a levade and pays intimate attention to the features of Whistlejacket's body. Minute blemishes, veins and the muscles flexing just below the surface of the skin are all visible and reproduced with almost photographic accuracy. Despite the isolation of the subject from natural surroundings Stubbs manages to create a living animal. Rockingham paid 60 guineas for the portrait. Contemporary opinion was that the painting was unfinished; it was believed that Rockingham had intended to create an equestrian portrait of George III, with Stubbs painting the horse and two other notable portrait and landscape painters filling in the king and the landscape respectively. Various reasons are given for the painting remaining "unfinished". In one account, it was intended as a piece to accompany a similarly-sized equestrian portrait of George II by David Morier, but Rockingham changed his mind. According to Horace Walpole, it was intended as a gift for the King, but Rockingham supposedly had not bothered to progress with the painting after falling out of favour, and ordered it hung at Wentworth Woodhouse uncompleted instead. Another reason popularly cited for it being "unfinished" is that Rockingham was so impressed by Whistlejacket's furious reaction when confronted by Stubbs working on the painting in his stable, that he ordered it hung without further decoration. 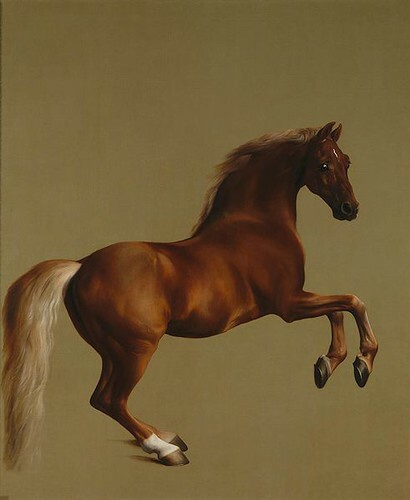 There is little evidence for this view: Stubbs produced other paintings of horses against blank backgrounds for Rockingham, nothing in the painting indicates that it is not complete, and the detail of the shadows cast by Whistlejacket's rear legs on the ground suggest that this is how Stubbs intended the picture to be seen; the absence of background details intensifies the sense of power that the horse projects as it rears and twists its head. In 1762, Stubbs painted a second portrait of Whistlejacket, with two other stallions and a groom, Simon Cobb. Lovely pictures, keep on posting. You have so much knowledge, you really should put pen to paper!!! 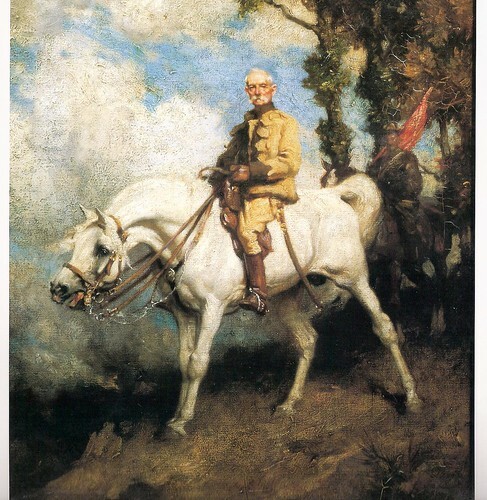 Sorry, kind of hi jacking a little, but I love the painting by Stubbs of Whistlejacket ... Anyone know if he is pure Arab or what his breeding is? ?